The Devils began a two game homestand with a visit from their neighbors to the north, the Phantoms. And it was all Albany, from start to finish. Scott Timmins scored his second goal since returning to the lineup early in the first period for a 1-0 lead. 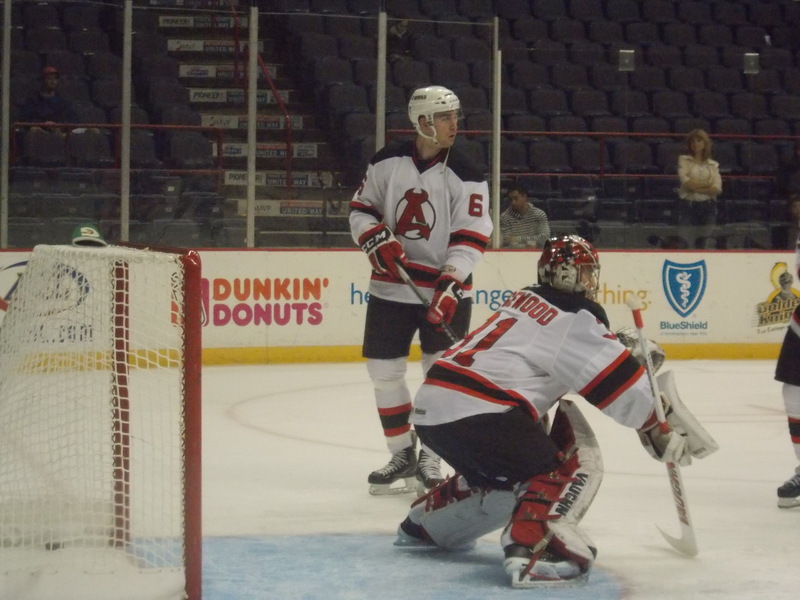 After that, it became a goaltending duel between Keith Kinkaid and Adirondack’s Cal Heeter. The Devils had plenty more chances on net, including outshooting the Phantoms 14-5 in the second period alone, but Heeter settled in. It took an empty net goal from Chris McKelvie with 3.7 seconds left in the game to break up the duel and give the Devils their fifth home win in a row, and evening up the Time Warner Cable Cup series at 3 wins apiece. Just another solid evening for Kinkaid, as he stopped all 19 Phantom shots to pick up his AHL leading fourth shutout of the season. Joe Whitney and Mike Sislo had the lone assists. 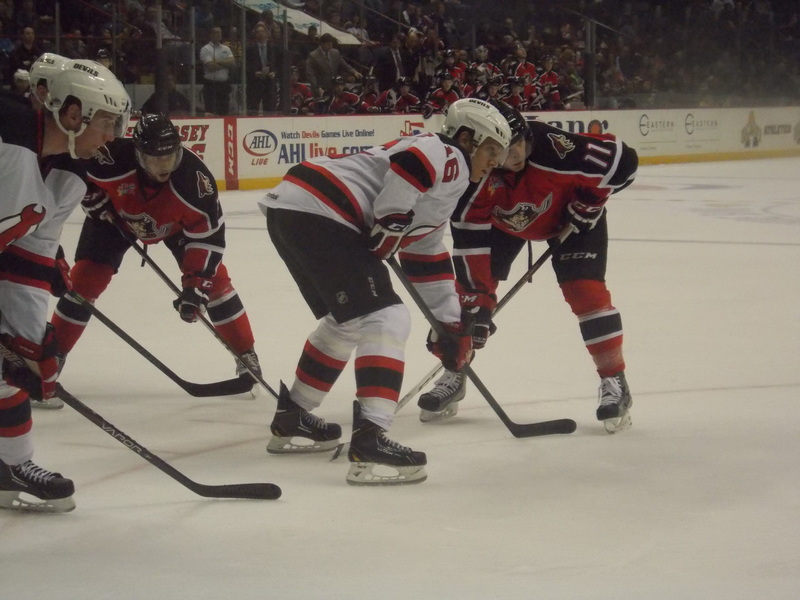 To finish out the 2013 home schedule, the Devils played host to a well rested Pirates team, who had already been in town since Friday after a Thursday night win in Manchester. A rare scoreless first period lead the way to a huge second for Albany, as they scored three times on Portland goaltender Mark Visentin. Joe Whitney scored his 11th halfway through the second for a 1-0 lead. Seth Helgeson followed with a Eric Gelinas-like shot from the blue line 1:35 later for his first to make it 2-0. Mike Sislo would follow that 3 minutes later with his 9th for a 3-0 lead. Andy Miele would break up Keith Kinkaid’s bid for a second straight shutout late in the period. 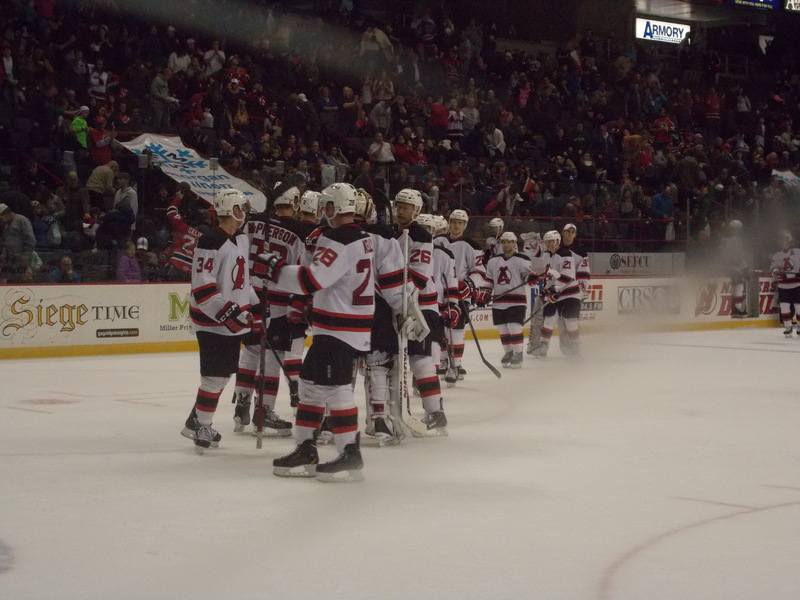 The Pirates would try to show signs of life in the third, outshooting Albany 17-4, but Kinkaid stopped all of them. Rod Pelley would add an empty netter with 5.6 seconds left to seal the victory, a franchise record sixth in a row on home ice. Another good outing for Kinkaid, stopping 38 of 39 shots and getting #1 star honors for the second night in a row. 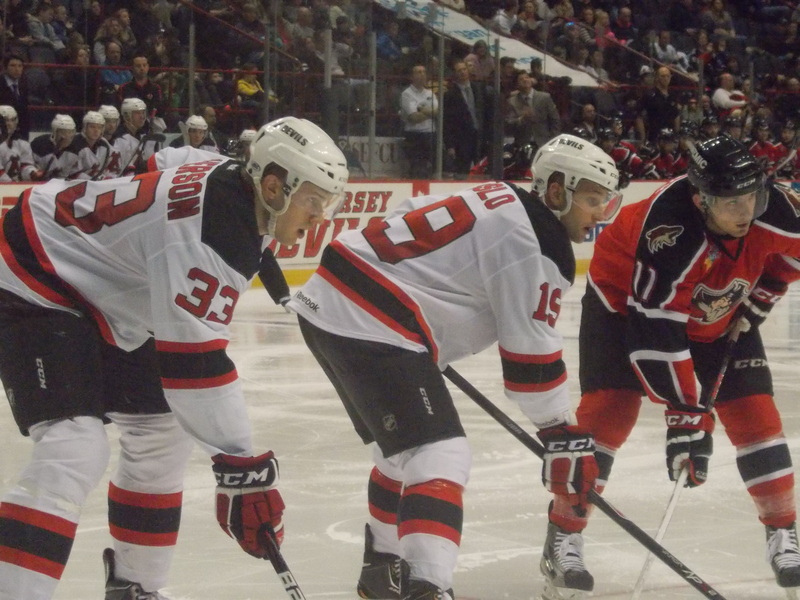 Scott Timmins added two assists and 3 other Devils had one helper each. For the first time in quite awhile, 4 full lines! 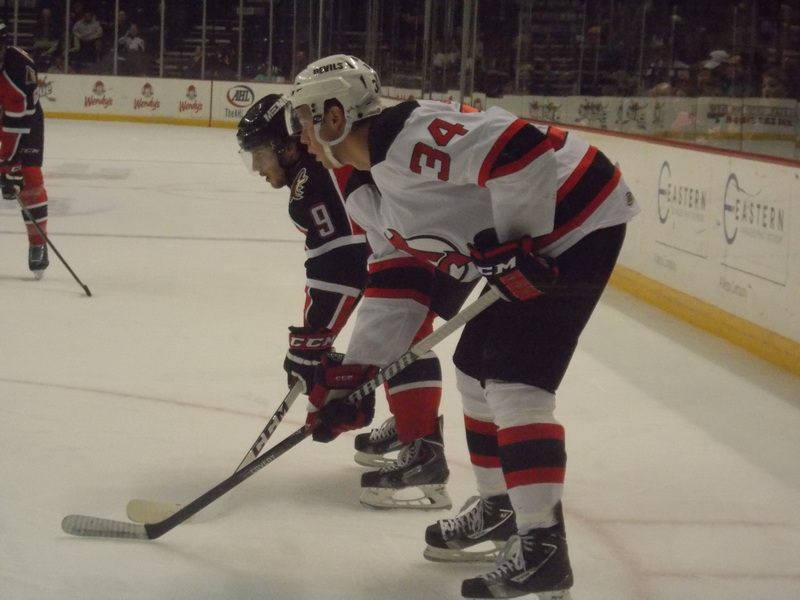 The first three in three weekend of the season came to an end in Bridgeport, where the Devils were making their third visit in the month of December. Tim Sestito got the visitors on the board early in the first with his first goal since returning from New Jersey. Joe Whitney would add his 12th on a power play halfway through the second period to put the Devils up 2-0. Things fell apart in the third, as the Sound Tigers rallied with a strong third period, outshooting Albany 12-2. Pierre-Marc Bouchard would break up the shutout just 56 seconds into the period to cut the lead to 2-1. Joe Diamond would tie the game up with just over 6 minutes to go in regulation. Albany had to kill off two late power plays just to get the game to overtime. Only the Sound Tigers managed to get one shot on net during the extra session, and it was on to the shootout. Mike Sislo and Alan Quine traded goals in round 1, then both teams were kept off the scoresheet for the next five rounds. Harri Pesonen and Mike Halmo scored in round 7, followed by scores from Reece Scarlett and Matt Donovan in round 8. Philip-Michael Devos would score in the 9th round, but Chris McKelvie was unable to match him, and Bridgeport finished the comeback by taking the extra point. Not a bad showing for Scott Wedgewood, who took the loss and stopped 32 of 34 shots, not including a 5 for 9 shootout effort. Harry Young registered his first point of the season with a first period assist, while three other Devils had helpers. UPDATED 1/1: Brandon Burlon letting out a little frustration with this one. Three candidates will split this week. A very good weekend for the dynamic duo of Joe Whitney and Scott Timmins (3 points each), and another strong two games out of Keith Kinkaid (57 out of 58 shots stopped in 2 games, league leading 4th shutout of the season). Not a good return from Christmas for the Jackals, as they lost three straight to Reading and Greenville to see their record fall to 9-15-1-2. 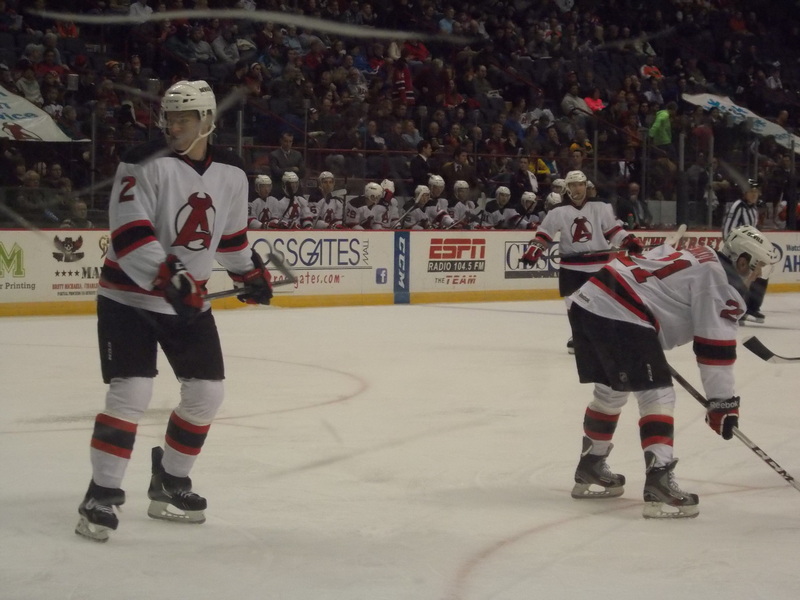 Maxime Clermont made one appearance, a 6-2 home loss to Reading on December 26th. He now stands at 4-7-0 with a 3.54 GAA and a .889 save percentage. -The team earned standings points in all but one game, finishing with a 7-1-1-1 record. -Offensively, an average of 3.60 goals per game. On the other side, 2.00 goals against. -Keith Kinkaid lowered his GAA from 2.15 to a league leading 1.92. He is the only AHL goalie to have a GAA under 2. With New Jersey finally getting bodies back in the lineup, it’s having a trickle down effect here. Tim Sestito was the first to be sent down, on Saturday after the NHL holiday roster freeze was lifted. He appeared in 9 games after being recalled on December 1st, notching two assists. Only two games on tap after the Devils ring in 2014. A big matchup looms on Friday night at home, as the first place Springfield Falcons come in for the first of three games in a week’s span between the two teams. Saturday night they travel north on Interstate 87 to Glens Falls to take on the Phantoms. Celebrating 6 home wins in a row, a new franchise record! Since my December events photo gallery didn’t work out (I ended up taking less photos than planned…and the photos I did take weren’t exactly publish-worthy), I thought I’d bring back a holiday tradition from last season…how other teams around the league are celebrating the Christmas season. Since you’ll never see it here, of course. Let’s start with the defending Calder Cup champs out in Grand Rapids. Sorry, boys, N*Sync you’re not. Not even close. And then Rudolph. Well, sort of. The annual Rochester Americans 12 Days of Christmas rendition. Sigh. And yes, that is Patrick Roy’s son with the 5 power play goals. But at least some of these players could probably do a better job at naming Santa’s reindeer than Cam could. For those that missed it or just want to enjoy it again here’s the link. Merry Christmas (or Happy Festivus) to all!